University Grant Commission has sanction Gandhi Study Center to the Degree College of Physical Education under the scheme of Epoch Making Social Thinkers of India from the session of 2009-2010. The purpose of this centre is to propagate the thoughts of Gandhiji among the youth of College. This Gandhi Study Centre was inaugurated on the 25th August 2010 by the hands of renowned Social worker Shri. Gautamji Bajaj from Paramdham Ashram, Pavnar, Wardha and Dr. Nupendra Prasad Modi, Head, Dept. of Ahimsa and Peace, Mahatma Gandhi International Hindi University, Wardha. 1. To run the short duration courses for the students. 2. 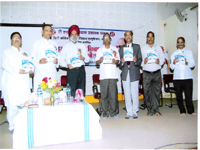 To conduct Seminar, Conferences to propagated Gandhian thoughts. 3. To publish the literature regarding the Gandhiji. 4. To prepare research project. 5. To publish the research project in magazines, news papers. 6. To visits the various Gandhi Centre. This center has framed three months regular and six months correspondence course regarding Gandhian Studies. One hundred and twenty five student s from different colleges of Amravati city has taken the admission along with college students for these courses. Every Saturday (evening) and Sunday (Morning) the lectures of experts are being organized for the admitted students. 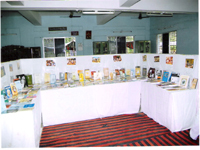 This centre has organized two day’s National Seminar with the collaboration of Shree H.V.P.Mandal in the auditorium of the college on 26th and 27th November 2010. 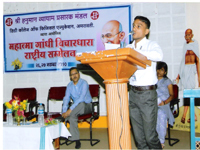 The theme of the Seminar was “Youth Power, National Integration Gandhian thoughts”. This seminar was inaugurated by nephew of Martyr Bhagatsing Prof. Jagmohan Dhariwal Ludhiyana (Punjab ) and Shri. Basant, ex-member of Khadhi Gramodhog Commission Govt. of India was the president of function. Ad. Rammohan Rai. Working editor of Nitynutan magazine of New Delhi and Dr. Kailash Khambre, Registrar of Mahatma Gandhi International Hindi University, Wardha was guest of honor. Dr. Avinash Sawji social worker from Amravati and Dr. Kale, Principal social work college, Amravati, were the chief guest of valedictory function of the seminar. Dr. G. S. Negi, Director, Gandhi Study Center of Kumau University, Nainital, Dr. N. P. Modi from International Hindi University Wardha, Prof. Dr. Anil Choudhari from Kumau University, Nainital (Uttarkhand), Prof. R.S. Mehara, Itarshi (M.P.) were the resource person for the seminar. Two hundred sixty five Research scholars, Students, Lectures, Social workers have attended the seminar and forty five researcher have presented their research papers in the seminar Books exhibition related to the Gandhiji’s literature was also arranged in the Seminar.